We start with the elementary facts about focus and depth of field. An in-depth review of manual focusing methods includes some which may be unfamiliar. We relate the formula for zone focusing to a useful proposition from perspective theory. The effects of focus, lens aperture, and depth of field on image blur and viewing size are quantified using a novel diagram. Some conclusions may challenge the conventional wisdom. A movable distance scale, marked with a range of distances from close up to infinity. This is a non-linear scale: the offset of each distance mark from the infinity mark is inversely proportional to the distance. 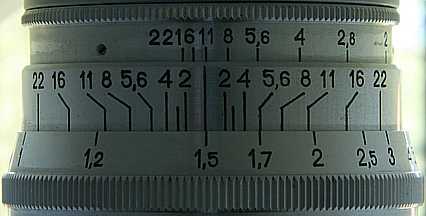 A fixed depth of field scale, with index marks for a range of F‑numbers. Each F‑number has a pair of marks, on opposite sides of a central index mark. This is a linear scale: the offset of each F‑number mark from the central index mark is proportional to the F‑number. When the lens is focused on an object on the optical axis at a given distance from the lens, the plane perpendicular to the optical axis at this distance is sharp in the image. This object is not necessarily the photographic subject, which will be in focus anywhere in this plane. Parallel planes are more blurred in the image the further they are in front of or behind the object. For a given lens aperture, the nearest and farthest planes where the blur is acceptable intersect the optical axis at the near point and the far point. The central index mark shows the object distance. 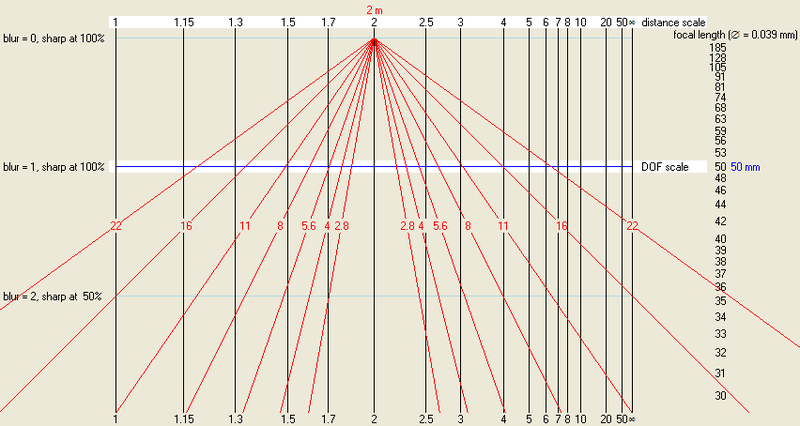 Each pair of F‑number index marks show the near and far distances for the corresponding lens aperture. For the desired F‑number, set one F‑number mark to infinity, and read off the near distance from the opposite F‑number mark. Read off the object distance from the central index mark — this is the hyperfocal distance for that F‑number. The near distance is half the object distance. For the desired F‑number, set one F‑number mark to the near distance, and read off the far distance from the opposite F‑number mark. Read off the object distance from the central index mark. For the desired F‑number, set one F‑number mark to the far distance, and read off the near distance from the opposite F‑number mark. Read off the object distance from the central index mark. Set the central index mark midway between the near and far distances (by aligning them with opposite marks on the depth of field scale). The central index mark is set midway between the distance marks, not midway between the distances that the marks represent. Read off the required F‑number against either of the near and far distance marks. Read off the object distance from the central index mark. The first method is the conventional depth of field read-out, which would normally be used to confirm that the depth of field covered the subject of the photograph. The second method, focusing at the hyperfocal distance, is often advocated to maximise depth of field for landscapes and street photography. The third and fourth methods are not particularly useful. The fifth method is the best one when the desired near and far distances are known: it's called zone focusing in the Wikipedia Depth of field article. The near distance is easier to set, as the distances marked at the near end of the distance scale are closer together. The far distance is less critical because of the compression of the distance scale at the far end. When the far distance is infinity, this method sets the object distance to the hyperfocal distance for the indicated F‑number, which is twice the near distance. Zone focusing is constructive in that it both sets the required focus and indicates the required F‑number. This is better than using a pre-determined F‑number as in method 2. The object distance it determines is independent of the focal length of the lens and the maximum acceptable circle of confusion used to determine the required F‑number. So a higher F‑number can be used at this object distance to reduce the blur at the near and far distances, in case the depth of field scale is inappropriately calibrated (as with a 35mm film lens is mounted on an APS-C digital camera body, for example). Zone focusing equalises the circle of confusion at the near and far distances. The two tangents give the envelope of the circles of confusion at intermediate distances along the line, and it is evident that they shrink to a point, in perfect focus, midway between the endpoints. The first and fifth methods, the most useful ones, can be also used with auto-focus cameras. Method one is standard auto-focus on the subject, with depth of field read-out possible if the lens has both of the requisite scales. Method five is implemented on some Canon EOS cameras as DEP or A-DEP mode. In DEP mode, available on some Canon EOS film cameras and early Canon EOS digital cameras, two half-presses of the shutter button auto-focus on near and far points in turn, and the full-press calculates and sets the required focus and aperture. In A-DEP mode, available on most recent Canon EOS digital cameras, one half-press of the shutter button selects the near and far distances from the nearest and farthest auto-focus points, and the full-press calculates and sets the required focus and aperture. During focusing, it is permissible to rotate the camera about the optical axis to align the required near and far objects with auto-focus points. The 'focus and recompose' technique should be avoided, as this would change the distances of the near and far points. The effects on image sharpness of the different focusing methods can be illustrated in a two-dimensional diagram in which the F‑number marks are replaced with a pencil of F‑number lines which converge at the central index mark. The vertical dimension of this diagram indicates the amount of image blurring. The circle of confusion is the out-of-focus image of a point in the scene. The blur value is the diameter of the circle of confusion relative to the maximum acceptable circle of confusion. For digital photography, it is natural to identify the diameter of the maximum acceptable circle of confusion (for which we use the symbol ø) with the pixel pitch (the spacing of photo-detector sites on the sensor). (The common usage of calling this the pixel size is not strictly correct: a pixel is not a little square.) A blur value of zero represents perfect focus. When the blur value is one, the diameter of the circle of confusion equals the pixel pitch, and there is little, if any, perceived loss of sharpness. Higher blur values are perceptible when the image is viewed at 'actual size' (100% zoom) on a monitor or printed at standard resolution (usually 300 dpi). The image will appear sharp, however, when reduced in size by zooming out or printing at higher dpi. My subjective impression is that blurred images look sharp when reduced to 1 ⁄ blur of their original size: by zooming to 100 ⁄ blur percent or printing at blur × 300 dpi. The diagram shows the required reduction according to this rule of thumb: 50% zoom at blur = 2, for example. 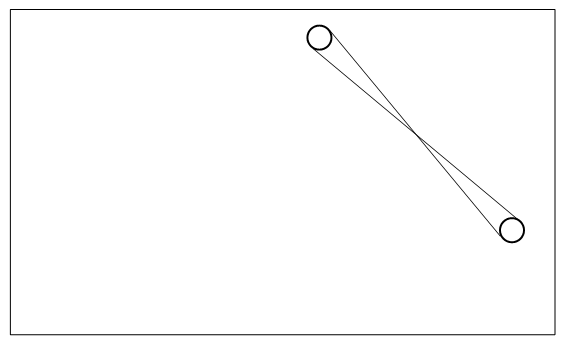 The dark blue line with blur value of one is at the position of the conventional depth of field scale for a given focal length and ø (shown at the right of the diagram). The dark blue line intersects the pencil of F‑number lines at the corresponding F‑number marks for reading against the distance scale. For a given distance, the vertical black line intersects the pencil of F‑number lines at points where the corresponding blur value can be read from the left-hand scale. 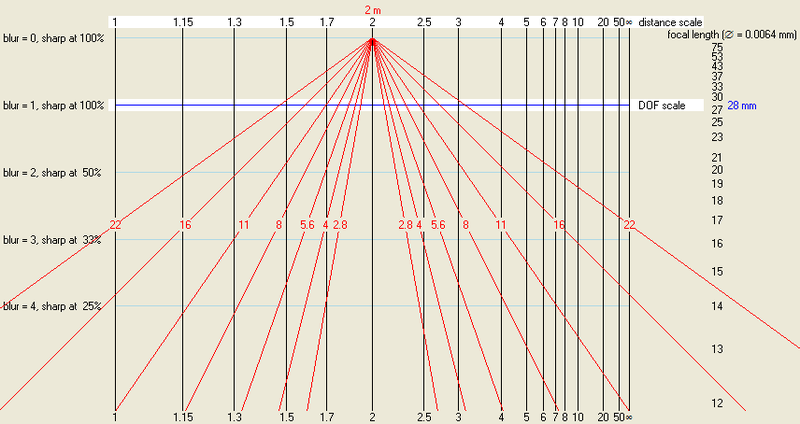 In the above diagram, for example, where the focus is at 2 meters, the blur value for 1.7 meters is 1 at f/5.6 and 2 at f/2.8. 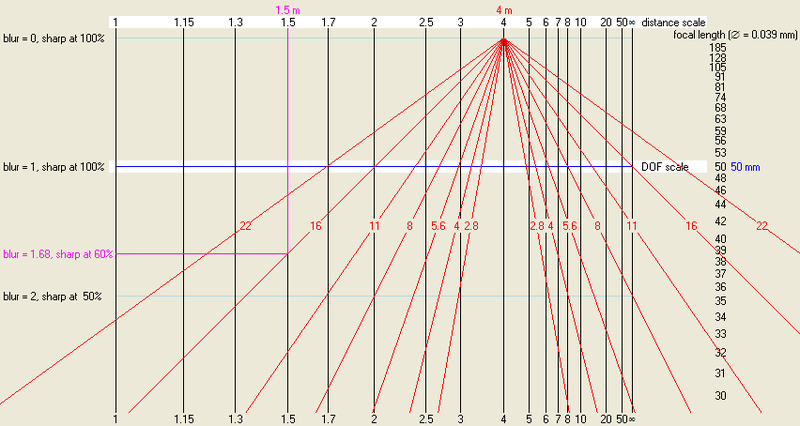 The red lines for a given F‑number effectively plot a graph of sharpness against distance, falling away on the near and far sides of the object in focus. Moving the mouse over the above diagram changes it to an example of method 5 for a near distance of 1.5 meters and a far distance of ∞. The central mark has now been positioned at 3 meters, midway on the distance scale between 1.5 meters and ∞. At f/16, the near distance of 1.5 meters is now sharp at 75%, as is infinity (down from 100%). Method 5, however, would have recommended setting the F‑number to f/22. For manual focusing, optimise depth of field by zone focusing from the near to the far distance. For automatic focusing, optimise depth of field by use of DEP mode or the much maligned A-DEP mode, if available. Alternatively, focus on a point midway in the viewfinder between near and far objects. To optimise depth of field to infinity, don't focus on the hyperfocal distance for a pre-determined aperture. Focus on twice the near distance by zone focusing from the near distance to infinity. Set the smallest feasible aperture. Set maximum circle of confusion to the sensor pixel pitch, to directly relate depth of field to the viewing size of the image.